Certain fashion trends will always be classic, like putting a blossom in your hair! From the fashion runways to the prom and wedding dance floors, this trend is HOT! Flowers in your hair add an air of romance and are an instant, fresh upgrade to your special occasion style for the spring and into the summer. If you're using fresh flowers, favor smaller buds like spray roses. Try a small five petal blossom like stephanotises, or commonly known as Madagascar Jasmine. These 1-inch-diameter star-shaped florets have an intense fragrance that is reminiscent of true jasmine, which is how they came by their common name. Another option is dendroibim orchids which are the small deep purple orchids popular in centerpieces. 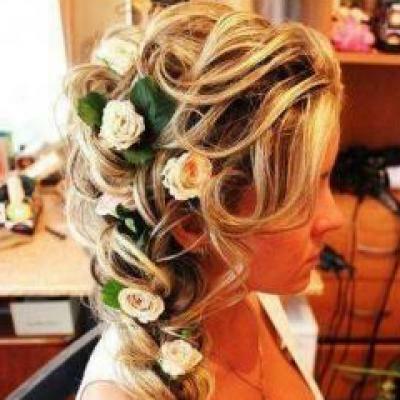 All of these fresh flower types are hardy blooms and won't wilt under the bobby pins used to secure in your hair. If you are going faux, a single white silk flower like a rose or gardenia adds a chic statement on a slick bun. Bonus: if you're a DIY junkie, you can make your own floral hair accessories! All you need are small alligator hair clips, a glue gun and the bloom of your choice. Add gem stones for more glamour, the possibilities are endless and your creation will be unique. For more style inspiration, visit our Get the Look photo gallery exclusive to Hair Cuttery. Or check out our boards on Pinterest or follow us on Instagram.